What is Permite Cream (Permethrin) used for? 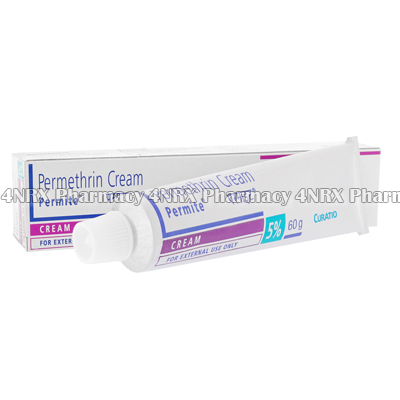 Permite Cream (Permethrin) is a topical anti-parasite medication prescribed to treat lice or scabies. The medication paralyzes and destroys the organisms and their eggs to prevent the spread of the infection. Your doctor may also recommend its use for the treatment of other unlisted conditions. How should I use Permite Cream (Permethrin)? Permite Cream (Permethrin) should be used strictly according to your doctor`s instructions and those included with the packaging to get the best results from treatment. It is normally prescribed to be applied once, but your individual direction will depend on your age, weight, health condition, and the severity of your symptoms. To use the medication shower and dry yourself thoroughly, apply the cream all over your body avoiding the mucous membranes. Wait eight to fourteen hours to allow the medicine to destroy the infection before thoroughly showering to remove the medication. It is also necessary to dispose of or thoroughly wash your bedding and any clothing you wore while infected to prevent any relapse. Thoroughly wash your hands after applying the cream to prevent it from contacting any mucous membranes. Ask your doctor any questions you have about the medicine to ensure the correct usage. What are the side effects of Permite Cream (Permethrin)? Serious side effects that may require emergency medical attention are severe pain, burning, or signs of an allergic reaction such as hives, rashes, swelling, or difficulty breathing. Inform your doctor about any worrying or intense side effects you encounter to make sure the necessary changes are made to your dosage or application frequency to prevent further health problems from occurring. Permite Cream (Permethrin) should not be applied to severely broken or damaged skin. Do not begin using this medication if you are allergic to permethrin or if you have had a bad reaction to similar treatments. Also inform your doctor of any other chronic health conditions you have that may cause unexpected problems from occurring. Strictly use this medicine as prescribed and follow all instructions provided by your doctor. Safe, suitable, and optimum dosage can vary and is dependent on the patient`s health and medical history, as well as the condition you are treating. Permite Cream (Permethrin) may not be safe or suitable for all patients. Always ensure your doctor is informed if you are pregnant or breastfeeding, using any other type of medication (including non-prescription medicine, vitamins, and supplements), as well as if you have any allergies, other illnesses, or pre-existing medication conditions.